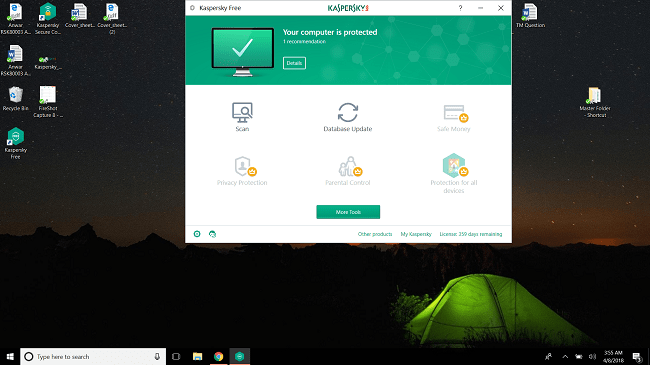 Kaspersky Vs ESET | Which Antivirus Software is Better in 2019? 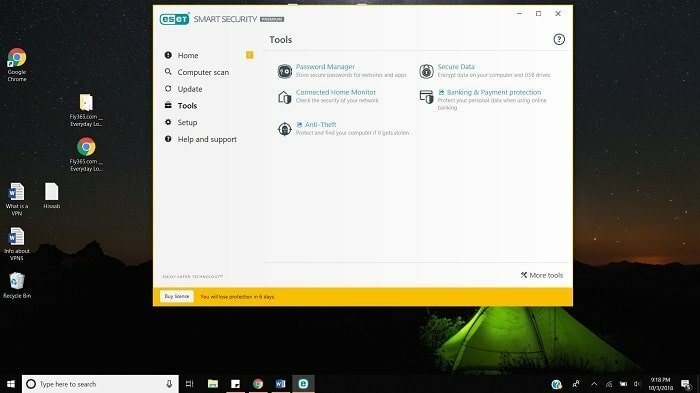 Kaspersky or ESET, which antivirus software is better in 2019? Read this comprehensive, data-driven comparison to make a smart decision. In this ultimate guide, you’ll see what’s included in different antivirus suites ESET and Kaspersky offer, as well as how both software stack up against one another in terms of malware protection, impact on system performance, user interface, cost, and more. During the past few months, we evaluated and reviewed over 50 antivirus suites from the biggest names in cybersecurity, so you can confidently choose the best antivirus software to protect your data and privacy. Overall, Bitdefender is our top antivirus recommendation for 2019, because of how well it performed in the recent independent lab tests conducted by AV-Test and AV-Comparatives. 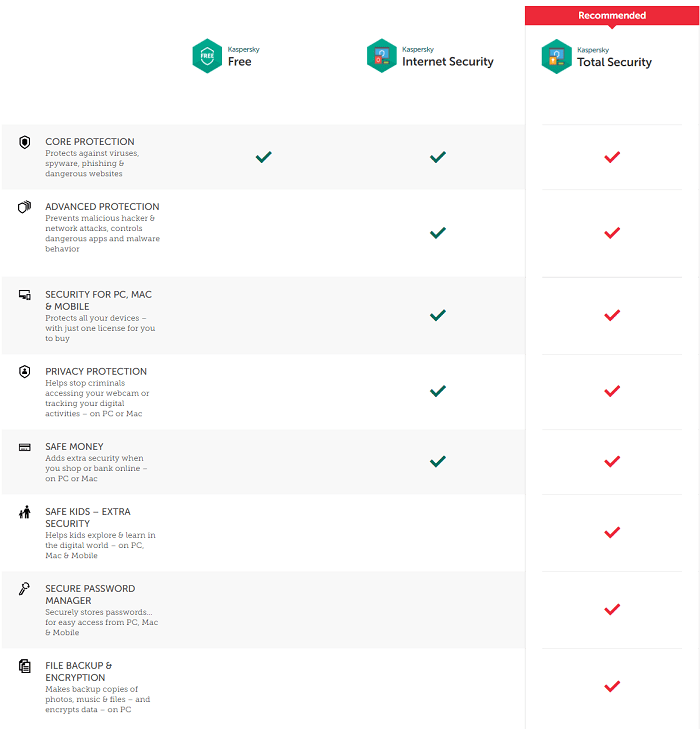 Right now, we think that Bitdefender Total Security 2019 (currently at 50% off) is the best antivirus package available in the market. Besides providing excellent malware protection, it offers all the advanced premium features and utilities that must be there in a high-end package - and best of all, it offers excellent value for money. You can protect up to five devices (PCs, Macs, and smartphones) with a single license of this suite. If you have more than five devices in your household, we recommend Bitdefender Family Pack 2019. With a single license of this suite, you can install Bitdefender Total Security suite on an unlimited number of devices. These days, it’s likely that a large part of your life is stored in your internet-enabled devices, mainly computers and smartphones. A study held by a reputable media company found that the average American devotes over 10 hours a day to screen time. The so-called ‘digital freedom’ we enjoy comes at a cost. Do you know the AV-Test – which is an independent security institute — detects over 350,000 new malware samples every single day? Every link clicked, email opened, purchase made, video streamed, file downloaded is an opportunity for hackers to break into your computer (and other devices) to compromise your data and privacy. Even if you only visit trusted websites, avoid clicking dangerous links, and stay away from shady neighborhoods, experts say that you still need a reliable security software to protect your data and privacy. It’s always better to be safe than sorry. First, let’s see the security suites Kaspersky and ESET offer. If you are in a rush and want the answer right away, see the graphic below and also read our short verdict. Kaspersky is the better option as it offers more protection-related features and extra utilities in its security suites than ESET. Independent tests prove that both software provide excellent malware protection with minimal impact on system performance. However, Kaspersky is cheaper than ESET. Our recommendations: Overall, after examining over 50 antivirus suites from different companies, we think that Bitdefender Total Security 2019 (currently at 50% off) is the best antivirus package you can buy in 2019. You can protect up to five devices (PCs, Macs, or smartphones) with a single license of this suite. If you have more than five devices, Bitdefender Family Pack 2019 might be the best option for you. If you're looking for a security solution for Mac, we recommend Bitdefender Antivirus for Mac 2019 for maximum peace of mind and great value for money. What’s Included in Kaspersky’s Antivirus Suites? Offering different levels of protection at different price points is a common trend among cybersecurity companies. Kaspersky’s line-up of security products starts with the barebones Kaspersky Free, which is only compatible with the Windows platform. The freeware offers protection against different types of malware threats (such as viruses, worms, ransomware, Trojans), but you won’t find many advanced protection-related features or utility tools incorporated into the product. Next level up is another Windows-only suite, called Kaspersky Anti-Virus. Besides offering top-notch protection against all kinds of malware threats, it offers multi-layered ransomware protection, complete web-browsing protection, a vulnerability scanner (checks for outdated software and other exploitable vulnerabilities), and the Game Mode feature (minimizes notifications for uninterrupted user experience). Another level up is the multi-platform compatible Kaspersky Internet Security. It includes everything found in the previous suite, plus a firewall utility (filters malicious network traffic and blocks attacks), a hardened web browser (helps protect your financial details when you shop/bank online), and a limited parental control module (blocks inappropriate content for kids and lets you to keep a check on their online activities). Protection against webcam/microphone spying is also built into the product. The suite is compatible with PCs, Macs, and smartphones and comes at different price points depending on the number of devices covered in the plan. Kaspersky Total Security is the company’s high-end antivirus package, boasting almost all the advanced features and utilities you can expect to find in a mega-suite. It includes everything found in the “Internet Security” suite, plus a full-blown password management tool (stores all your passwords and other details in a secure vault), the Data Shredder utility (lets you delete your confidential files securely so no one can recover them), and an encryption tool (helps create digital vaults on your drive where you can store your important data). A full-fledged parental control module is also included in the package, along with a useful back-up utility (automatically creates backup copies of your data). Kaspersky recently introduced another high-end security package, called Kaspersky Security Cloud. It contains all the advanced features/tools jammed into the “Total Security” suite, plus it comes with “patented adaptive technology” which claims to adjust your security settings automatically and advises you based on your activities. The package comes in two versions, Personal and Family. The only different between the two versions is that the Family edition lets you install protection on up to 20 PCs, Macs, and smartphones (in any combination) for $149.99 per year, while the Personal version costs more or less the same as Kaspersky Total Security, $89.99/year for 3 licenses and $99.99/year for 5 licenses. Note: All premium Kaspersky security suites are compatible with Windows, macOS, Android, and iOS platforms, apart from the entry-level Kaspersky Anti-Virus package. What’s Included in ESET’s Antivirus Suites? ESET offers separate products for different platforms, but some of its products are multi-platform compatible. First, let’s see what ESET offers for the Windows platform. ESET NOD32 Antivirus is the company’s entry-level package for the Windows users. It provides protection against almost all kinds of malware threats, but there are no premium security features or tools integrated into the package, other than the useful Silent Mode utility. One level up is another Windows-only suite, called ESET Internet Security. It includes everything found in the entry-level suite, plus a two-way firewall, an email filter (blocks junk emails and phishing scams), a hardened web browser, an anti-theft module (helps find lost or stolen devices), and the Network Monitor utility (protects your Wi-Fi network against hackers and intruders). Webcam protection is also built into the “Internet Security” suite. 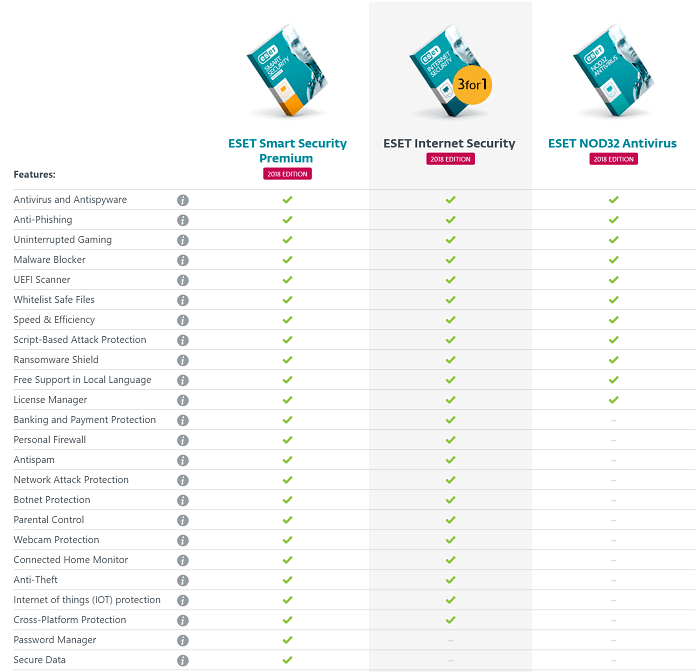 Another level up is ESET Smart Security Premium – the company’s top-drawer offering for advanced PC protection. It includes everything that’s jammed into the “Internet Security” suite, plus a password management tool, the Secure Data module (an encryption utility that creates secure, virtual drives where you can keep your confidential files), and a full-blown parental control module. If you have many devices in your household running on different platforms, you can consider ESET Multi-device Security Pack. A single license of the suite means you can install all ESET products (including those compatible with Mac and Linux) in any combination. But the downside is that there’s still a limit on the number of devices you can protect with the license. So, if you have many devices in your household, Bitdefender Family Pack 2019 is an absolute bargain. It allows you to protect an unlimited number of PCs, Macs, and smartphones with the top-shelf Bitdefender Total Security 2019. Now, let’s see what ESET offers for macOS. The company offers two specialized security suites for macOS, ESET Cyber Security and ESET Cyber Security Pro. The former provides comprehensive malware protection along with several additional security utilities, while the latter adds firewall and parental controls to its younger sibling. Kaspersky vs. ESET: Which Software Offers Better Malware Protection? Malware protection component (also called detection engine) is the heart of a security suite. Malware can be categorized into two types: known malware and unknown malware (also called zero-day malware). The former type of malware can be detected using the traditional signature-based scanner, which usually works by matching suspect files against a database of known malware signatures. It’s the latter type of malware that poses a higher risk, it can’t be detected using signature-based scanning as it exploits a previously unknown vulnerability. Most modern security programs employ heuristics scanning (checking for behavioral attributes of a file) to detect zero-day malware. To see how good ESET and Kaspersky are in terms of malware detection, I will look at the most recent independent examinations conducted by AV-Test and AV-Comparatives – two well-known and most respected security laboratories in the antivirus landscape. AV-Test’s most recent two-round evaluations were conducted in September and October 2018. The tests evaluated different participating products against both widespread and zero-day malware samples. Kaspersky was one of the few products that received the perfect 6/6 rating from the AV-Test experts in the “Protection” category. It whipped all malware samples it was tested against during both months and only gave a single false positive case. ***False positive is counted when a security software wrongly detects a legitimate file/URL as malware-infected. ESET, on the other hand, didn’t participate in the recent AV-Test examinations. Austrian lab AV-Comparatives also conducts a range of exhausted tests to determine how effective a security product is against malware infections. The two main tests that give useful insights into the malware detection capability of a product are the Real-World Protection Test and Malware Protection Test. The recent Real-World Protection Test report released by the lab includes combined results of five consecutive tests which were conducted in regular intervals, between July and November 2018. Kaspersky was among one of the few products that were awarded the highest “ADVANCED+” award in the “real-world” study. It notched up impressive protection rate of 99.4% with no false positives. ESET, on the other hand, didn’t perform as well as Kaspersky. Its average protection rate during the five-month period was slightly lower, at 98.9%, which means it had to settle for the second-best “ADVANCED” title in the test. It also gave a few false positives. The Malware Protection Test is held after every few months by AV-Comparatives. The recent version of the test – which was held in September 2018 — evaluated 18 top security products against 11,890 malware test cases. ESET’s performance was quite exceptional in this test; it received the highest “ADVANCED+” title because of its near-perfect 99.94% protection rate with very few false detections. Kaspersky, on the other hand, could only get the second-best “ADVANCED” title, primarily because of its relatively lower 99.87% protection rate. It also returned 5 false positives during the test. Overall, it’s a tie in this category as both ESET and Kaspersky are in the same league when it comes to malware protection. Kaspersky vs. ESET: Which Software Puts Less Impact on System Performance? Most modern antivirus products are extraordinarily light and do not put a significant burden on system performance (or system speed). Let’s look at how Kaspersky and ESET fared in the recent independent performance tests. 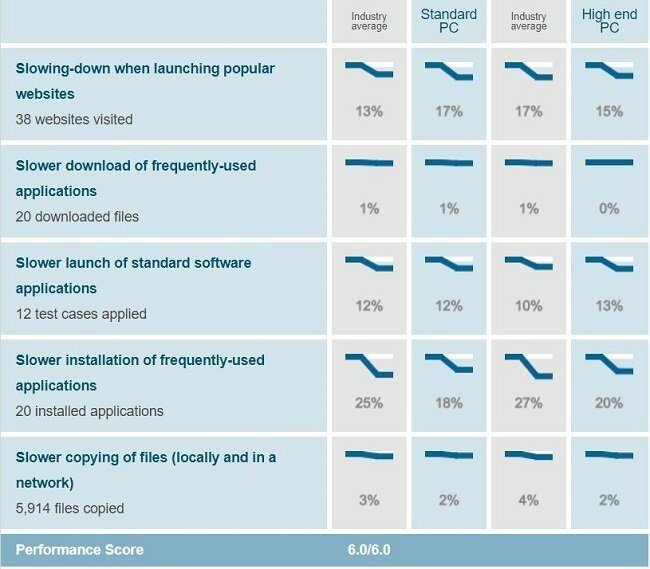 In the “Performance” category of the AV-Test examination, the impact (or influence) of each participating product is measured in terms of system slowdown experienced while performing a set of standard computer operations, like launching popular websites, downloading & installing applications, copying files, and more. 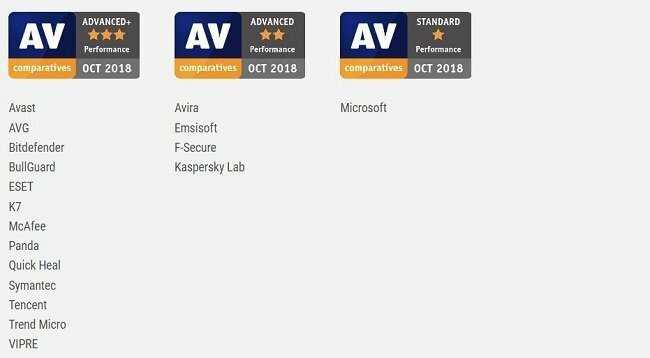 Kaspersky got full marks from the AV-Test experts in the “Performance” category. ESET, as mentioned earlier, didn’t take part in the recent AV-Test examinations. The experts at AV-Comparatives also conduct an exhaustive test to measure the impact of various antivirus software on system performance. The most recent evaluation involved 17 software and was held in October 2018. ESET was awarded the highest “ADVANCED+” award in the test, because of its exceptionally lower impact score of 1.7. On the other hand, Kaspersky got the second-best “ADVANCED” award in the test, due to its slightly heavier impact score of 11.9. Overall, it can be said that neither Kaspersky nor ESET will slow down your system. Kaspersky vs. ESET: Which Software Offers Better User Experience? It’s important for security programs to provide a good user interface. First, let’s delve into the Kaspersky interface. Kaspersky’s interface is neat and elegant, in colors of white and dark green. The default view has a lot of information and links, but everything is so well-organized that it doesn’t look crowded at all. The green banner at the top is where you’ll find your current protection status. Below the banner are six main modules, namely Scan, Database Update, SafeMoney, Privacy Protection, Parental Control, and Protection for all devices. Each module contains a set of related features and other options. The name of the suite you have installed on your computer is shown in the title bar. The bottom bar links to Settings, Help, and more. Now, let’s go over the ESET interface. ESET’s interface is simple, bright and airy. Along the left, you’ll find six categories, namely Home, Computer Scan, Update, Tools, Setup, and Help & Support. Home is the default window, it shows your current protection status and has links to different advanced modules, like the Secure Data utility. If everything is safe and secure, you’ll a reassuring “You’re Protected” message with a green checkmark next to a creepy robot (okay, it’s not so creepy). The message quickly changes to “Attention Required” or “Security Alert” depending on the seriousness of the issue that needs to be addressed. The other categories are pretty much self-explanatory. The name of the product you’re subscribed to is displayed at the top. The bottom bar shows the number of days remaining in your subscription plan. Overall, Kaspersky’s interface is more intuitive and robust that ESET’s. Overall, Kaspersky’s antivirus suites are cheaper than ESET’s. Also, you can protect multiple devices with a single license of Kaspersky. Kaspersky vs. ESET: Which Software is More Popular Among Users? Now, let’s see which software reigns in terms of popularity. According to the report, Avast is currently dominating the market with an impressive 18.44% market share. McAfee and Malwarebytes are second and third with 12.58% and 12.23% share, respectively. ESET is fifth on the list with 9.09% share, while Kaspersky (6.65%) claims the seventh position. So it’s clear the ESET is more popular than Kaspersky in the antivirus landscape. This website is reader-supported, meaning we get a small commission if you buy through our links, at absolutely no extra cost to you. We have been offered huge commissions by a number of mediocre antivirus companies to promote their products, but -- unlike other websites -- we have refused to do so. We only promote products that we believe are the best for you. ... but we also have bills to pay. And we rely on generous people like yourself. So if you'd like to support our cause, please consider purchasing antivirus software through links present on this page. Our recommendations: After reviewing over 50 antivirus suites from some of the biggest names in the cybersecurity landscape, we believe that Bitdefender Total Security 2019 (currently at 50% off) is the best antivirus suite for 2019 in terms of value for money. A single subscription of the suites lets you protect up to five devices (PCs, Macs, and smartphones) in any combination. Plus, it comes with premium customer support and a 30-day money-back guarantee. If you have more than five devices, Bitdefender Family Pack 2019 is the best option for you. Umair Anwar is an experienced freelance writer and founder of Proficient Blogging. He has covered a range of topics, including antivirus software, VPN, online privacy, and data protection. FTC Disclosure: Our editors maintain strict editorial integrity and review products independently, but we may earn a small commission if you buy through our links (at no extra cost to you). This helps pay our bills and make this website a free service for everyone. Don't rely on low-end, incomplete antivirus protection when your security is at stake. Protect yourself and your loved ones with the best antivirus software available. Take advantage of the exclusive offer from Bitdefender and save 50% today. Which Antivirus Software is Your Choice?